Documenting the dramatic history of Australian settlement, this monumental work describes the rich ethnic and cultural inheritance of the nation through the contributions of its people. It is one of the largest reference works of its kind, with approximately 250 contributors and almost one million words. 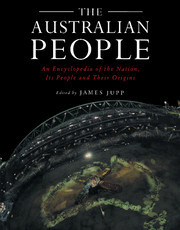 Profusely illustrated in color and black-and- white, the book is both a comprehensive encyclopedia and a survey of the controversial debates about citizenship and multiculturalism now that Australia has attained the centenary of its federation. A first edition, which appeared in 1988, quickly became recognized as the standard reference and for many smaller ethnic groups, the only reliable resource. This new edition incorporates data from the 1996 Census, gives greater weight to immigrants from outside Europe, and provides some fascinating essays on "Building a Nation" in the final section. This unique reference will appeal to a general and an academic audience. It will be a lasting resource within Australia as well as internationally. List of figures, maps and tables; List of contributors; Introduction; Part I. The Peopling of Australia: 1. The indigenous people; 2. The convict period; 3. Imperial settlement; 4. Immigration since the Second World War; Part II. Indigenous Australians: 5. Society and culture; 6. Politics and the law; 7. The indigenous and Australian society; Part III. The Settlers: 8. Ethnic entries, from A to Z; Part IV. Building a Nation: 9. Assimilation and integration; 10. The term 'Australian'; 11. Australian nationhood; 12. Citizenship in Australia; 13. Concept of 'the Australian'; 14. Cultural diversity; 15. Economics of immigration; 16. Human rights in Australia; 17. Public policy towards immigrants; 18. Language policy in Australia; 19. The legal status of immigrants and refugees; 20. The making of the Anglo-Australian; 21. The mass media, immigration and indigenous issues; 22. Multicultural arts; 23. Multiculturalism in Australia; 24. Multicultural literature; 25. The origins of multiculturalism; 26. National identity; 27. Productive diversity; 28. Public opinion on immigration; 29. Racial discrimination; 30. Refugees; 31. Political representation; 32. Reconciliation; 33. Republicanism; 34. Settlement policies since 1946; 35. Social provision; Appendix 1. Overseas birthplaces of Australians (1996 census data); Appendix 2. Languages spoken by Australians at home (1996 census data); Appendix 3. Religious affiliations of Australian (1996 census data); Chronology; Bibliography; Index.